New Delhi, March 20: Union Minister Ravi Shankar Prasad on Wednesday hit out at Congress leaders for making "derogatory" remarks against Prime Minister Narendra Modi for his blog on dynastic politics. "The kind of 'abusive' attack the opposition has launched on PM Modi for his comments is 'derogatory'," Prasad told ANI. Earlier today, Prime Minister in his blog post attacked Congress for indulging in dynasty politics, which had left the opposition simmering. Slamming Modi for his comments, Congress leader Tariq Anwar had said: "A person who does not have a progeny cannot take the legacy of the dynasty forward. Modi Ji does not have a successor in the family, which is why he is making such comments." 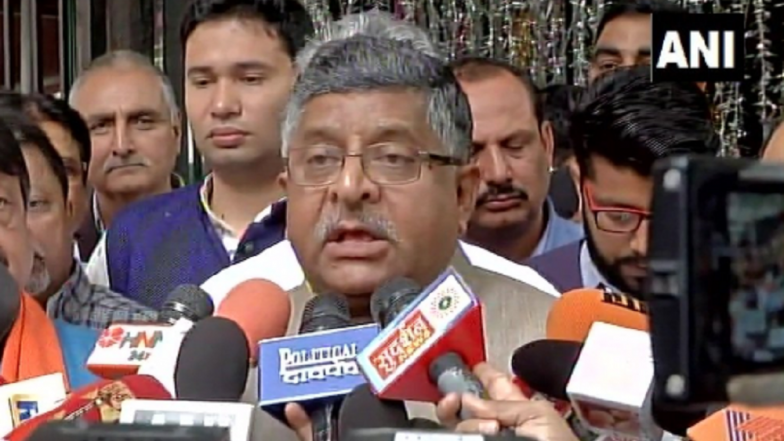 EVM Hackathon in London Was Congress Sponsored Event, Says Ravi Shankar Prasad. Calling these just mere tactics to deflect the discourse, Prasad said: "I would like to tell them that the entire 130 crores of Indians are part of Modi's family." He also pointed out that in Congress, no one becomes the President or leader unless he is from the family. He also accused the Gandhi family of being reduced to an "enterprise" while adding that the defeat is staring them in their faces ahead of the ensuing Lok Sabha elections.